Historically speaking, RPGs have never been much of a social activity. You could feasibly make a weekend out of inviting the guys over to hang out, have some beers and play some Halo. I don’t think anyone would have nearly as fun a weekend if we did the same thing with Dragon Quest. Considering the narrative and gameplay constructs of traditional RPGs, it would be like inviting someone over to read a book with you. RPGs are a solitary past time, they’re generally meant to be a single-player experience. Unless I can toss a friend a controller and ask if they want to join in, I feel rude playing a game in a social situation. RPGs also require a considerable amount of dedication and personal input for the player to get the desired experience. Not everyone wants to slog through mountains of lore and character development to be able to enjoy a game. Not everyone has 40+ hours to dedicate to getting to “when things start getting good.” They also aren’t known for reinforcing social behaviors. RPGs may thematically promote teamwork and friendship and cooperation, but the overall experience still ends with you being in charge of everything. Learning to work alongside others to achieve a goal is almost entirely alien to the RPG genre. With the advent of Massive Multiplayer Online RPGs, the entire genre was upended. What was once an entirely solitary experience became a social one for a population that was universally unprepared. All of a sudden, players weren’t in charge of every single element of the game’s progress anymore. The individual went from being in a position of micromanaging control to fulfilling a specific role. Not only that, but they also had to start listening to directions from others and counting on the other members of their party to do their jobs. Hell, finding other players that not only can do the job, but are actually willing to spend time with you is little short of miraculous. Being forced to count on others to succeed is a shock to the system when one is so unfamiliar with it, but I would say it’s something we’re all unfamiliar with together. MMOs, by design, are an experiment in cooperation and interaction involving those (I know I’m generalizing here) least suited to the task. 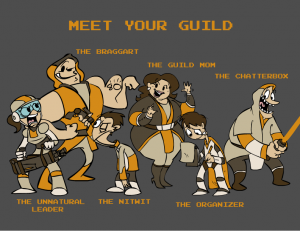 The Organizer will be the only reason anything in your guild gets done. They will dedicate hours to putting together dungeon groups, PvP teams, Saturday night raids and even the summer guild picnic. They can’t relax until something is on the guild calendar. They’re not above calling others out to get a job done if a team is shorthanded. These are the guys that really know their stuff, and they expect the best from everyone. The pressure can get to be a bit much at times, so the Organizer may not always be in the best of moods at the 11th hour. The only way to placate them is to register on the guild website. Every guild has that one older player that everyone knows. Unlike their younger, more impetuous counterparts, the Guild Mom is patient and nurturing. They know everybody in the guild on a first name basis and will say hello to everyone as they log in. They will always want to know how your day has been. When things go wrong in a dungeon or raid, they’ll be there to kiss your boo-boos and encourage you to keep trying. The Guild Mom will always “grats” you on your achievements, no matter how small. They’re even known to referee arguments when guildies turn on each other. They are the glue that keeps the guild together and provide for a much more personable experience in a world full of hostility and trolls. Common user of the /hug emoticon. Other than Guild Mom, you will not find a friendlier player than the Chatterbox. The Chatterbox is the champion of off-topic conversation. Actual in-game events will probably be the last thing these guys ever want to talk to you about. The Chatterbox is much more prone to gushing about what he saw on TV last night, what band she’s listening to, what’s been happening at his school lately – pretty much whatever thought chances to enter his head. They also have a fondness for naked dance parties (I can almost promise they will have a “remove all armor” macro). They’re fun to be around, but hard to depend on. Their chattiness will get the better of them at times and they will occasionally sideline their priorities (say, keeping you alive) to make sure the guild knows their girlfriend might be coming to town next weekend. It’s hard to stay mad at the Chatterbox, but still, never let them heal. Possible role-switch to Nitwit if they shirk their responsibilities too often. At some point, everyone has been a newbie. We all begin a game with only limited understanding of the mechanics and overall way of thinking required to succeed in the environs. During our learning experience we have all undoubtedly done something so catastrophically wrong or poorly as to have us chastised players for being “THAT STUPID $#^&ING N00B!” However, I wish to make it clear “newbie” is NOT synonymous with “nitwit”. Probably the simplest definition of Nitwit is a newbie that has gone past his expiration date. Being competent is, like I said earlier, a learning process, but there comes a point where it’s clear the process is failing. When someone is a high enough level, it’s hard to understand why he doesn’t get some of the most basic tenants of the game, or why he just won’t quit bugging you. They can be identified by their penchant for beginning, ending and crafting entire sentences with “lol”, boasting about inane achievements and complete lack of mechanical understanding of the game. But the hallmark of the Nitwit is his incessant need for help. Whether it’s finishing a quest or getting enough money to pay for an upgrade, the Nitwit pleads with everyone in the guild to hold his hand through the process. Sometimes he’ll even try to help out or (God forbid) try to lead a party – these efforts almost always end in embarrassing failure. Nitwits genuinely want to be helpful and liked, but their actions tend to be counter-intuitive and off-putting for others involved. For those more experienced players with kind souls that want to help and educate the greener players, working with the Nitwit always ends with an inexplicably frustrating headache. Possible role-switch to Guild Little Brother, depending on their sense of humor and humility. Frequently mistaken for trolls. Achievements and trophies seem to have been shoehorned into games to play on our innate collecting and gambling instincts. For some of us they seem to tap straight into some sort of driving primal desire. Achievements can be a fun way to measure how far you are in a game, prove your worth to others or encourage you to play through the game in a way you normally wouldn’t, but some people just need them. Some people can look at an achievement description and think, “That doesn’t seem like it would be worth the time and effort,” others just can’t get their brain to recognize that disparity between effort and reward. There are players out there willing to repeat completely menial tasks ad nauseum just for an extra title or a few extra achievement points. The focus is almost always on the vanity features of the game – special mounts, pets, costumes, etc. The goal of completion outweighs the desire to have fun. Every time I’m in a dungeon and one of the party members says, “Hey, can we try for achievement” I know to start jamming the “vote to kick” button to save myself the frustration. If you mess up while helping one of these guys, you will be starting over. Achievements will be skipped only after significant duress and disappointed mealy-mouthing. To further complicate things, a sub-category of the overachiever is the Braggart. It’s one thing to have all these trivial accomplishments, but these guys aren’t satisfied with just that – they expect the wide-eyed admiration that all Level 85 Hunters with the most pointlessly-difficult-to-find-and-capture pet in the game surely must deserve. These guys don’t want achievements so much as they want you to know they have these achievements. No accomplishment can compare with theirs. They also tend to brag about their accomplishments on other servers. The most obvious difference between the two is Overachievers are frustrating to work with; Braggarts are frustrating just to be around. Getting things organized in an MMO is hard work (see: Infuriatingly Frustrating) and some people just aren’t cut out to deal with the stress/disappointment. Getting anything done is hard enough, but when things go wrong, the Unnatural Leader snaps. Where others will let you know if you are doing something wrong or just aren’t keeping up well enough, the Unnatural Leader will berate you for any shortcoming they observe. Then they’ll quit out. In fact, they’ll usually be gone the minute anything goes wrong. Did someone not make it out of the boss’ AoE range and pick up some agro? Gone. Not bringing down enough DPS as some of the others because you popped your cool-downs too early? Gone. These are the guys whose time is simply too valuable to be spent with anyone other than fellow MMO professionals. Due to their overall perfection and intolerance for ignorance, they have a hard time socializing outside of communicating their expectations/disappointment in the party. This high level of standards also precludes them from dropping out quietly when things start to get rough. Once they’ve decided to quit the team, you can pretty much count on them to let everyone know just how $#^&ing stupid they are. Usually with Caps Lock. They have no time to offer advice or guidance, their parting remark is usually something along the lines of suggesting you kill yourself because you’re not good at a video game. These guys are pretty much a guaranteed find while PUGing. Note: The Unnatural Leader is the mortal enemy of the Nitwit. Just remember, everyone out there has different ways of communicating their inability to communicate with other human beings. MMOs are dangerous new territory for nerds, but they’re the closest some of us will ever get to truly interacting with the outside world. Jerks are everywhere, especially the Internet; don’t let them ruin your fun. Noah’s personal blog can be found here. Good article, Noah! Though I must note that MMOs didn’t completely overturn the social aspect of RPGs. The (still healthy) grandfather of roleplaying games, Dungeons & Dragons, completely depended on social interaction. You cannot play D&D alone. It’s actually very strange, considering that all RPGs were based on Dungeons & Dragons, that there are so many singleplayer videogame RPGs on there, now. MMOs didn’t introduce the RPG to social interaction, but it did reunite them. Nice article. However, I have to share I found the intro totally bizarre. I’ve spent weekends playing RPG’s in continous sessions with friends. DragonQuest was the first RPG I played with girls. Of course, I’m talking about pen and paper. To say, “RPG’s are a solo experience” is just unreal. Thank God computer based RPGs are finally allowing us to play with our friends. Again, back in the day, working with others is what RPGs taught you. @Haroun Haha I didn’t even catch that until you pointed out because I knew Noah was talking about single player RPG video games like Mass Effect. Obviously, the early pen and paper RPGs, where it all started, were all about cooperation. Here’s the great Wikipedia’s page on the DragonQuest TABLETOP rpg. I didn’t even know there was a console version until I read this article.